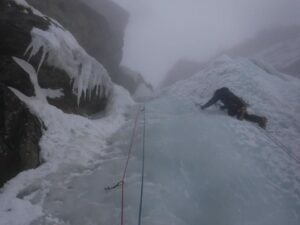 It was Jack’s idea from last year in Cogne, the ice would be easier, more variety of angle, and more Scottish Gully-like, so the same 4 signed up for Argentiere le Bessee 2019. The first day was simply superb, a narrow two pitch 3 called ‘Easy Rider’, followed by the left branch of a Y gully called ‘Holiday on ice’, also 3, but about 7 pitches, albeit not all of them climbing. The following morning it was snowing heavily, but stopped about 11. We felt the routes would be a bit banked up, but decided to go up and have a look at ‘Holiday on ice’, right branch (only the first pitch is shared). It was a bit harder due to having to clear the fresh snow as we climbed, but still good. The classic 4 ‘Les Formes de Chaos’ was on for the next day, and half of France had turned up to climb it, and two Corsicans just back from Scotland. No, not climbing there, but watching the rugby. “The Scots, they taka outa Jonnee Sexton beeg time.” We queued for about an hour, and in the event, I didn’t even get off the ground as Jack was hit on the hand on the first pitch by a big lump of ice, and had to be lowered down. Broken finger. No question of further climbing for him. George and Finbarr were at the top of the 60m first pitch at this stage so we retired to the coffee bar and sat with the skiers to watch them. 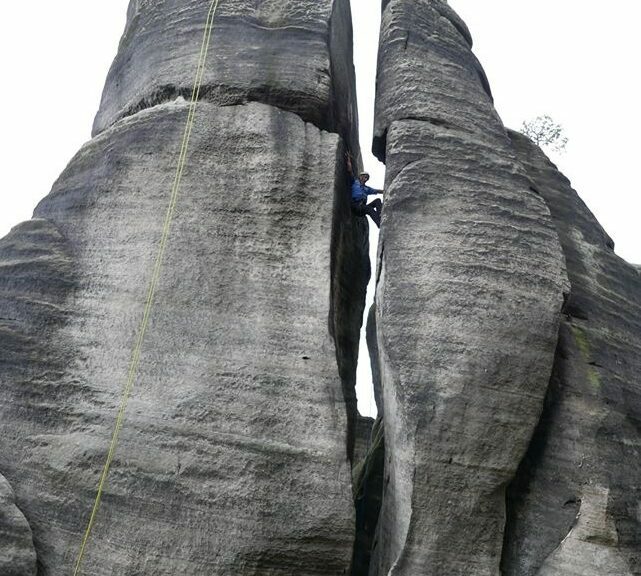 Due to the congestion, and a tricky boss third pitch, it took them all day to climb it. Our Gite/Auberge at Celiac was great and the food even better, but we moved down to Argentiere, the target for Thursday being a grade 5 called Hiroshima in the Fournel Valley. Following a very discernible path down to the river, it disappeared completely on the other side, and approach to the base of the route involved uphill swimming in waist to chest deep snow. I decided there must be a better way, and left George and Finbarr to it. Re-crossing the river and following the track up the valley, no other options presented themselves, so I went back down and was battling my way upwards in George’s collapsing steps, when himself and Finbarr appeared with Jack back on the other side. The route was in dangerous condition, so they had exited on the very path that I had been seeking. 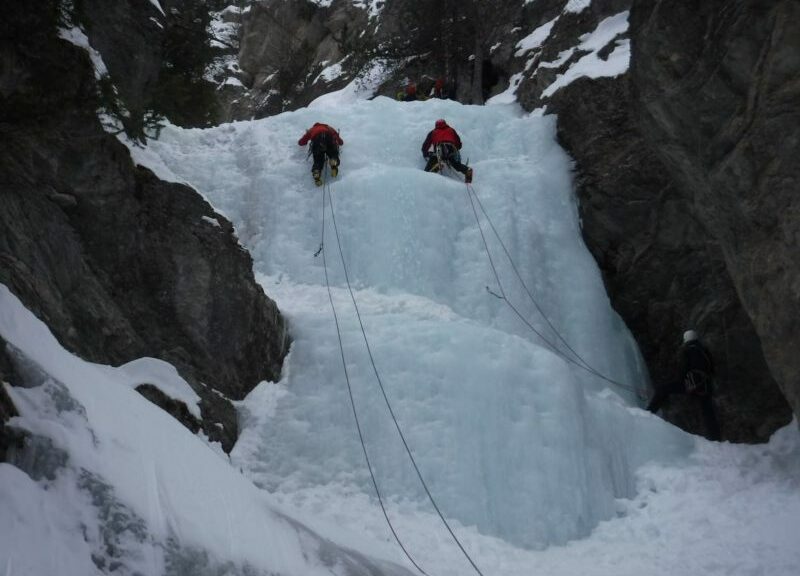 Plan B was a man-made ice wall just outside Argentiere (water pipes at the top) which provided us with 3 enjoyable routes of about 50m. The next morning we were starting airport-ward, and seeking a route in the La Grave area which, being higher, should be in safer condition that Hiroshima. George (from Ballymena you understand) was too tight to buy a guide book, so all were left to my recollections of climbing there with Bill back in the last century. “Le Pylon, that’s it over there”. But it wasn’t, which became clear after the first pitch. La Croupe de la Poufiasse 4+ 220m *** the classic of the area, was duly climbed by mistake, twa easy pitches by Finbarr and myself, then George leading the crux, followed by a busted Finbarr, with myself thumbing a lift back down with them. And so, to Grenoble, and home. Well, I would love to go back to this great area, but have concerns at the numbers of people now ice climbing in these popular destinations. Grade 3s are a lot safer, as the pitches are shorter and the steep steps tend to be separated by flatter areas which catch the falling ice. You can also wait until the party above clear the step, but pressure of numbers from behind, means that you tend to start below them with the danger of a piece of ice the size and weight of a Le Creuset frying pan smacking you on the head. If you climb below someone on a rock route there is a chance of something coming off, but on an ice climb it is almost inevitable, and the more sustained the route and the more climbers above, the greater the risk. No one’s fault really. I received an introduction back, I think, in 1998, and arranged to go for a week rock climbing in Scotland with this guy I had only just met, who was a presbyterian from north Antrim and who didn’t take a drink. I recall remarking to my late wife Irene that it might be a long week. In the event, we got on like a house on fire. Like most good friendships, a common interest can bond two individuals of very differing character. Trips to Scotland (again) Cornwall, Lundy Island, Norway, and the French and Swiss Alps followed. There was banter, some of it characteristically abrasive, but never a cross word, and much hilarity. A climbing partner is a powerful bond, each relying on the other for the judgement and support to survive, in what can be a challenging and hostile environment. The shared physical and spiritual experiences of our adventures has left me with many memories. Climbing Tower Ridge, Ben Nevis in perfect winter conditions, with Bill leading the Eastern traverse, and me arriving at the belay to be roundly abused for leaving one of his wires in a crack half way across. As it was corroded and rusty, I thought it had been ‘In situ’. I recall saying to him, “Bill you don’t have any old wires”. His reply was typically pithy, “ Well, I don’t have now”. Getting seriously off route on the Aiguille Dibona, me out on a small exposed ledge and Bill reading me out the guide book instructions, (translated from google) which made no sense, then having to down climb before we found the correct line. Bill tied to a steel cable on the Mont Aiguille in an electric thunderstorm urging me on, as I tried to slither up a chimney (without touching the cable) leading to the top, that had suddenly become a waterfall. Never entirely comfortable in a group, Bill was at his best with a friend, two at most, he didn’t need any more, and if you were that friend, he was loyal and giving with whatever he had. A character who put the stamp of his own personality on everything he did, be it his stove pipe hat, or bumble bee climbing outfit. He loved gadgets of all sorts, which came and went, courtesy of Gumtree or Ebay. I had always assumed that his devout abstinence from alcohol was a lifestyle choice, and even when he told me that he had an addiction in the past, I didn’t really take it seriously. Sadly, the demon resurfaced, and fed upon the ensuing troubles, creating a downward spiral that Bill fought as best he could, but addiction is a terrible illness, worse because we, who are not affected, do not, or prefer not to, understand. Following his cancer treatment, he never got back to the level of fitness he needed to get back out climbing, but found much reward in part time work as an extra in the movies. Over a pensioners’ lunch in Limavady, he would regale me with stories of The Queen of Dragons, Ned Stark and co.
Bill, I will miss you, am truly glad to have known you, and feel privileged to have called myself your friend. And in the beginning, there were enough people interested to plan two expeditions, the first to Spiti with Raja for three weeks (the original objective being the unclimbed Lynam peak 4700m) and the second to Langtang, with a trekking option. Those with the time and energy could travel from India and do both. A variety of reasons let to many cry-offs, and the Nepal one was deferred until 2019, but we had 5 for Spiti, visas arranged, flights booked etc. Alas, three days before take off, we were down to two, with Raja in a panic, having paid deposits, contracted porters etc. Just Jack and I at Dublin airport then, and a couple of days later we were in Manali, sitting in Johnston’s Hotel drinking beer, and looking out at a thunder storm. The crossing of the 4000m Rotang La, and 4500m Kussum La, were completed without too many problems, and we stopped at the Shambala Guest house, Lossar village, at the base of our valley. 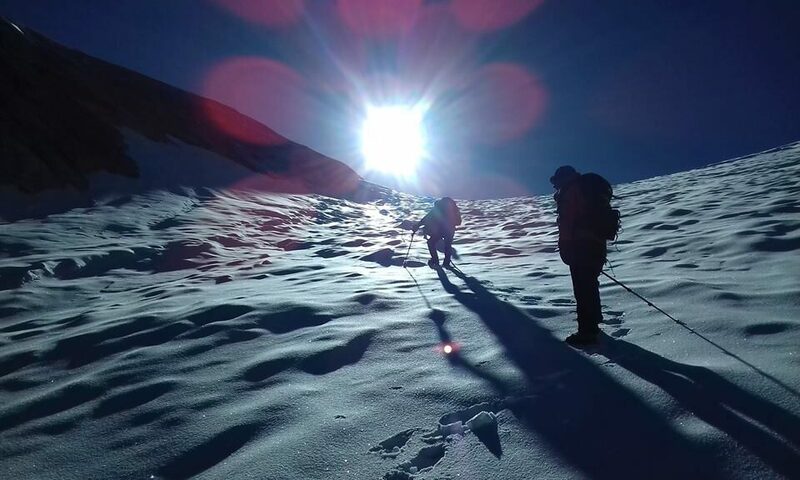 The next day was a tough acclimatisation exercise, doing a carry up the steep sided valley to base camp, 4000m to 4500m. Our 3 porters arrived after an 8 hours bus ride from Manali, to carry food and gear to BC, which they did the next day. We had a rest day, and went to see Ki Monastry, climbing back up to BC the following morning. The plan was to explore and climb in two subsidiaries of the main Lossar valley, doing a second ascent of peak 6015m in the first, and hopefully a first ascent of one of the 3 unclimbed summits at the back of the second valley. Two days later, we were sitting on top of 6015m, having also bagged Larimo 5800m, en route. The plan was going perfectly. Back to BC, move house to ABC, at the entrance to the second subsidiary valley, and then up to our second high camp on a glacier. 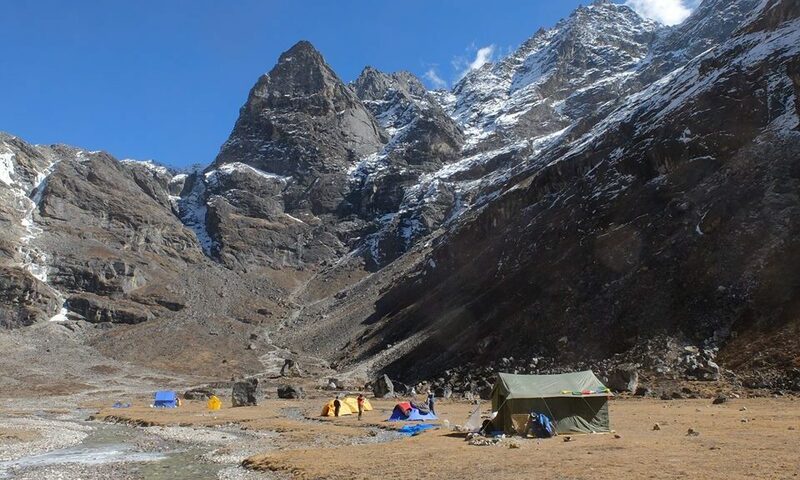 The problem was that we would have needed to establish a further camp to climb any of the peaks at the back of the valley, and we were short of porter power having only Lackpa and Pasang. Mighty men they are, Pasang having summitted Everest 3 times (including escaping from camp 6 in 1996- see ‘Into Thin air’) Kanchenjunga, Cho oyu, etc etc, but due to the reduced numbers, Raja had not enough funds to hire more Sherpas without making the cost prohibitive for Jack and myself. The two more accessible 6000m peaks had both been climbed, (Dom Rimo and Lossar Peak), but we decided to give one of them a go, and come down a day or two early, and perhaps enjoy a day and a half in Manali to shop and relax, before going home. The plan was to climb to the col in between, the two peaks, and decide which to tackle when we got there. We barely did! A huge steep hillside of sliding stones drained our legs, lungs and ultimately, willpower. Lakpa and Raja went a bit further but turned back. We returned to base camp and sunbathed, looking forward to another rest the following day, before the porters arrived from Manali. About 6.00AM it started to snow, and this continued all day, all night and the following day. It became clear that things were serious, and this was not just a snow shower as we had originally thought. We had to get out, and whilst we were fortunate to be back at BC, and not at a higher camp (that might easily have been the case), to traverse across the steep valley loaded with 3-4 feet of fresh snow on a bed of shale, with god knows how many thousands of feet of it above, was not for the faint hearted. We left carrying what we could, the rest packed up into the last standing tent. I left with less than half my stuff, Jack travelled even lighter. Also, we had no idea whether this weather was local, or whether the porters would have been able to get over the passes from Manali, or indeed our jeep would arrive at Lossar. We got out safely, thanks mainly to the brilliant route finding of Lakpa, to find the village also under a couple of feet of snow and, (as it never rains in Spiti), the stick and mud flat roofs in the houses were no match for such weather, and were leaking copiously. Still, we were safe! Safe and trapped, as both passes were closed towards Manali, and the connecting road to Shimla closed due to land slides. We learned that we were fortunate, as about 50 tourists were trapped in vehicles at lake Chandra above 4000m, and many others caught between the two passes, including possibly our porters and our jeep driver. There were local army in our village, but they appeared to be happy drinking tea and awaiting orders, rather than trying to rescue anybody. And still it continued to snow! Now the concern was whether we could get out to Delhi in time for our flight. With no sign of the passes opening in the near future, Raja turned his attention to the long way out, and made use of his numerous contacts to learn that the landslides near Poh (the base for our last expedition) were being cleared. We moved to the local capital Kaza, and waited for news. We were there in the queue, when it opened at 6.30 on Wednesday night. Got to Pio at 1.30AM, bus left at 6.15AM and 21 hours of continuous bus and taxi travel later, we were in bed in Delhi at 3.00Am. Up at 5.30 for the flight home. 4th July 2018 A last minute arrangement and another grand Wednesday at Malin Head. Geoff was a bit late getting to Culdaff due to road works, Irish Open etc, but we went to Malin Head for a look anyway. The Skildren Mor crossing was calm, but there were nesting birds, so we gave it a miss. We abbed down the big slab west of Stelfox in the Cauldron, and climbed a lovely route on compact sound black rock, with good protection, about Severe, but with a thin move or two of 4b, (40m), we called it Black Bush. Then we did a variation of the Lizard Line, Cutting Edge combination, starting up rebel Yell and following the quartzite vein all the way across to the col. Makes this ‘Cutting Line’ about Severe+. Finished off with Dawson’s Diedre. A good alternative to the Pro Am at Ballyliffin. Recommend this goes in the calendar for next year. Twinned with the Kendal Mountain Festival, it had lots of outdoor films ( full length and short) in the cinema, and guest speakers such as Andy Cave, Stephen Venables, Dawson Stelfox, Dermott Somers, and Cameron McNeish. All very entertaining, and nearly too much on, in fact. There was a big circus tent at the back of the hotel which was designated as ‘Base Camp’ with stalls from gear shops, Scouting Ireland, Mountain Rescue, Mountaineering Ireland, and a café where people could meet and chat. We were able to park the van overnight free in the car park beside the big top, within 200m of all the venues, and handy for all the town centre bars and restaurants. Cameron McNeish lecture on Friday night. Had a good morning out on Mangerton on Saturday and made it back for the match ( satisfactory result) then straight off to the screening of Sikkim Dreams’ in the cinema*, then straight back to the hotel for a lecture on the Alpine North faces by Dawson, Dermott and Tom Curtis ( very Funny) then Andy Cave. *Gutted I wasn’t nominated for best supporting actor. Had me acceptance speech written, but some old geezer called Attenborough pipped me at the post apparently. Sooo unfair. Sunday we went up Carrauntoohil from Cronins Yard. Not much snow left, but we met David and Agnes, facebook CCC members, and did the mountain with them. Another awesome mountain film at night, and home on Monday. It’s a good time to go to Kerry, the best county in Ireland I think. Well done to the organisers, a huge effort! The thing about ice climbing..
George, Finbarr and self set off to Cogne via Ryanair and Sicily Car hire, and it all went quite smoothly, meeting Jack Bergin, (who had driven out), within an hour of our arrival. George, a veteran of previous Cogne campaigns, rightly felt that we should start off with something not too difficult, particularly due to the age profile of his comrades. The handiest best known route of this type being Cascade Lillaz, we headed there, only to find that there was a substantial queue at the bottom. This came as a surprise as there was little sign of any other ice warriors in the village of Cogne. Undeterred, we headed off through the woods to come upon a much more daunting affair which George identified as Tutto Relativo, a 4, which looked like a Rjukan 5+. Not having ice climbed for about 10 years ( Finbarr has only done one route in Ponte Di Legno) we left Jack to belay George, and warmed up on a much smaller piece of ice to the right, placing and removing screws, and practising technique. This proved worthwhile, as when it came out turn to climb the first pitch of the route (which George had ably led following his ‘Point 5’ practise route), we managed better than a ‘ring rusty’ Jack. 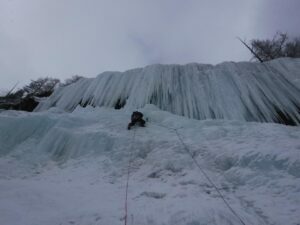 The second pitch was overhanging icicles, so we abbed off and went back down to Lillaz. Quiter, but now beginning to melt in the late afternoon, I led the first 60m pitch, Finbarr the second, and me again the third and forth. George had taken the steepest possible line on the first pitch, burning out Jack, so when we finished, we joined them in the café bar at Lillaz village. Great first day. Day 2 took us up a different valley and to the bottom of a grade 3 (looked like a Rjukan 4) called Thule. I had a notion to lead the first pitch but cowardice set in, and when I watched George struggle, I thanked the craven gods. 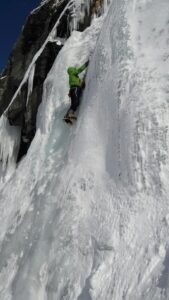 Actually it wasn’t too bad on a top rope, and I began to feel comfortable on ice again. George was belayed far back, about 20m below an ice curtain. Jack and Finbarr took a look at it and abbed off, while I belayed George. When he reached the icicles, he was concerned lest he hadn’t enough screws, and decided to belay in a cave underneath and bring me up. Cold water ran down his neck and the curtain looked frail, so he decided to abb off, but the screws were way off to his left, so he belayed me as I climbed up and took them out, before he lowered me back to the belay. 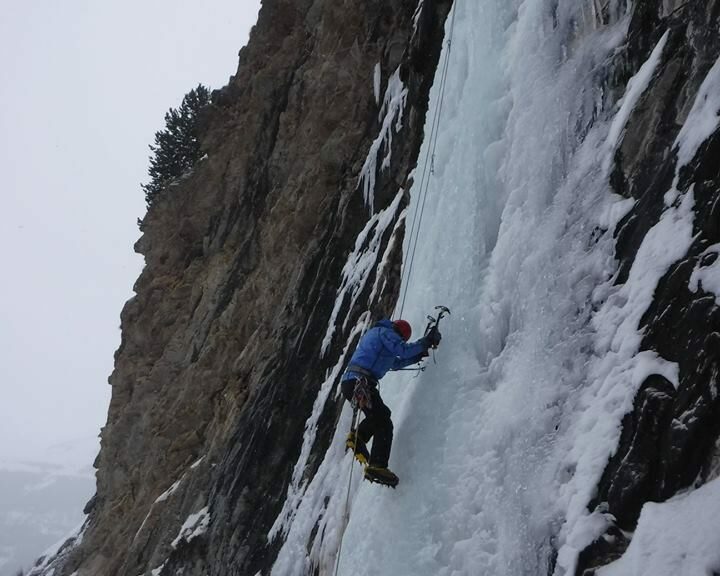 Some French climbers arrived at the belay and explained that it had been very dry, so what normally would have been a solid block of ice was now just a curtain of icicles, and thus harder. We bailed! Day 3. Poor forecast, and heavy snow. Rest and rugby. Day 4. Low cloud. A long walk into the ‘Money’ area in poor visibility (after our initial objective was considered very avalanche prone) sounds of many climbers led us up to the bottom of one of the most attractive routes called Cascade Di Patri 3 ( more like Picadilli Di Circuso). What did we expect on a Sunday? They disappeared quite quickly, and Jack and George led the first lovely pitch. I seconded Jack and led the short second and third pitches, catching up with the hoardes on the big fourth. Casting caution to the wind, I decided to lead, beginning a catalogue of incompetence, which I shall describe. A. First screw, handle gets entangled in my wrist loop- delay. B. Second screw won’t go in, as blocked with ice. C. Drop replacement screw. D. Next attempt cracks a piece of melting ice, and it has to be relocated. E. Finally get second screw in, but Elvis leg now in evidence, right glove soaking, and hand numb. F. Just as wondering if this was a good idea, Finbarr points out that he thinks my crampon has come loose. Get lowered off. Follow George up. Day 4. Every day starts off with a quandary, but seems to work out. This is no different. Clear but brutally cold, but at least we can see everything, everything that is buried in new snow, or has a queue. Across the valley there is a big route, Cool Couloir, still in shadow and with only 2 climbers on it. On reaching the bottom, we realise that it is big and steep and graded 4+, and the guys onit are not finding it easy. George, (he of Point 5), is keen, not having climbed it before, so Finbarr belays him while I decide to take photos. Camera drained by the -20 temperatures. George gets up it, and I learn that I will have greatness thrust upon me as Finbarr has cold feet ( and cold everything else). A sustained 60m pitch has me up with George. The second looks shorter and easier so we decide to give it a go. It is neither. The first two thirds of this 60m pitch is fine , but the top George described as Knarly. It was that, and a few other things, but worse, I got soft snow on my glasses, couldn’t see me feet, and couldn’t let go my axes to clear them. Somehow I got up. 2 abbs and we were down. Day 5. Injured knee, and Achilles tendon. Cleared up the room while the others went back to retrieve a screw dropped the day before. Drove to Bergamo, while Jack tried to unfreeze his diesel. Overnight in Bergamo, and home to meet the Beast from the East!! Irish Sikkim Expedition, a personal perspective. Why did I go? I knew the terrain was tough, the weather patterns unhelpful, and there would be long periods in the sleeping bags between short periods of euphoria. Maybe I had to get the monkey off my back after leaving the previous expedition almost as soon as I got to base camp. Maybe I thought it would be different this time, maybe I thought that with a fit young team of cutting edge climbers we would achieve something special? Maybe I wanted another great adventure, or maybe I just needed to lose weight. We crossed the river up at the lake (at the cost of one broken and mangled finger to Piaras) and set up ABC at 4300m in the valley above and to the right, with dramatic views of the Singel chu Needles. In the next four days we climbed 3 unclimbed peaks near the camp, Diwali Lho 4960 Scottish Gr 111 apparently, and two others either side of a saddle, the second a VS rock climb. Another peak was attempted from a high camp, but abandoned due to danger of frostbite. The photos of this area do not even come close to doing it justice. 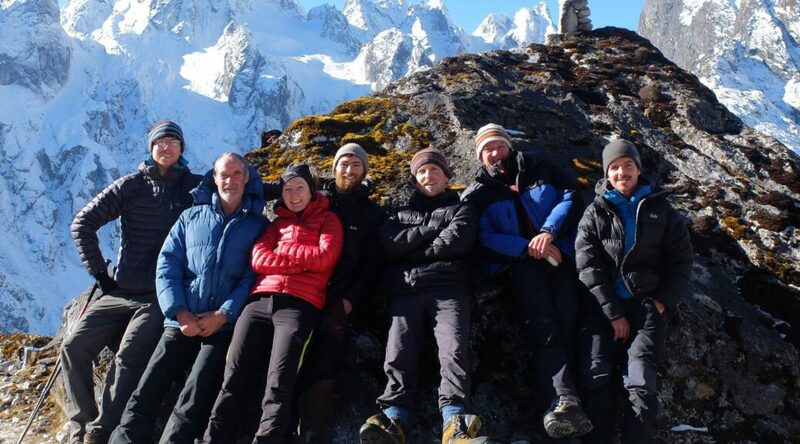 These guys are good climbers who, having studied pictures taken by the 2014 expedition, had big ideas about routes on the most challenging Zumthul Phuk peaks and needles. They were unprepared for the scale, technicality, and level of commitment required when they saw them in the flesh, and wisely settled for coming home alive. Up in the valley of ABC there are numerous more amenable unclimbed peaks, but with long moraine approaches. Back at base camp, 3 had had enough hardship, and descended with Raja, who was going down to arrange porters and a visa extension. Five stayed a further 3 days. We did a bit of exploration towards the German pass, but I developed a sore ankle after that, and decided to rest it before the descent from hell. Painkillers and determination got me down to Tolung Gompa in 9 hours, and the following day something similar to Mangan. This was the best couple of days weather we had! A day in Mangan, two in Darjeeling, and overnight on the train to Kolkata, with Raja entertaining us to dinner and a Bollywood Band on the last night. Didn’t climb to the summit of anything, but it was a great full on mountaineering experience, pure exploration, despite the hardships. Good bunch of lads from Ireland and girl from Finland, with never a harsh word spoken, and Raja’s team of Lackpa, Irun, Rakesh and Phurba were cheerful and tireless. Oh aye, and Raja found some footprints……..
Five of us flew Ryanair Dublin to Wroclau, in Poland, to be met by Ivan and Matty, and escorted the 100km drive to a cottage he had rented in the middle of the village of Adrapach, just across the Czech border. Karen had supper prepared for us and Ivan supplied the beer. In the morning the wonder of our surroundings became apparent, as the edge of this remarkable massif of pinnacles and towers could be seen across the field. Leisurely coffee and cake in the café was followed by an exploration of the nearest section of this city of rock. It is a tourist destination with well trodden walk ways threading their way between the most remarkable features, but the side alleys are the domain of the rock climber. The last guide book was 15 years ago and there were over 10,000 routes then. It is an intimidating place if you are a climber, and many a visiting rock star has left with his tail firmly between his legs. The rock is steep, holds rounded, and the ethics ramp the risk factor up by a multiple of at least 2. Chimneys and off widths abound, hand jamming cracks (the local climbers wear gloves), and normal gear and chalk are banned. Protection are knots tied in the rope, jammed in with a paint brush handle. There are ring bolts, but they are 20m apart, the first one is at least that off the ground, and I have no idea how the first climbers placed them, as you have to climb the tower first before you can abb it. AND, they all go a have a few pints in the morning BEFORE they go climbing. Awesome. But I suppose at 70 cents a pint Dutch courage comes cheap. 10 pints and change out of 10 euro! Ivan wisely decided to start us off on an easy grade 3. Ivan’s son Gerry (he who was lusted after by all the ladies) led and we took turns to get jammed in an off width. Very funny once you had done it, not so funny when you were clamped helpless and hopeless in its sandstone clutches. We abbed off somewhat humbled and traumatised. Something easier Ivan? Ivan scratched his head, too diplomatic to say that there was nothing easier. He picked a nearby short grade 5 without offwidth or chimney, and dignity was restored somewhat, with Sandra climbing it in trainers and a couple of us managing a harder variation nextdoor. Pub and Pizza and all was well. On Friday, Gerry was keen for us to try one of the classics, the normal route on the King, but as a warm up we did another pinnacle involving a chimney, an awkward traverse, and a short climb on pockets to the top, led again by Gerry. The King could not be put off any longer. The highest in the area, this tower is split by a 27m chimney, to the top of the lower of the two parts , step across, and climb a crack/groove onto the crown. Gerry led, followed by Martin. Then Sandra, and we watched as she taught herself the craft of upward momentum in the bowels of a chimney. Tension rose as she reached the top of the chimney, bridged, and looked up at the final section. “Aw fir fecks sake”, (said with such feeling), reached our shocked ears. Finbarr next. There was a lot of wriggling with no apparent result, before he cracked it, and away he went. Me next (less said the better) and Matti, whose 6 foot long legs must have struggled it the confined space, then Ivan, then down to the pub. The house began to fill up as friends of the Krella family arrived and we had a guitar music session around the fire with Czech and Irish songs sung with great enthusiasm. Egos were better, but now backs were bruised, so we decided to go walking next day, after a swim in the lake (‘No swimming’ the notice said, but Czechs do not appear to be able to read this type of sign). This walk took us around to a different side of the rock city, and we did a loop around terrain much like Petra, very popular with tourists, and busy as it was now the weekend. Ivan pointed out various epic climbs, some almost 100 years old. We watched young climbers, mostly top roping hard routes. This can obviously be done if it is not a detached tower. Lunch and pints at the far end, and a walk back through the pinnacles. Our final day, we went climbing again to a grade 4 tower called Noon. Gerry had gone to do hard things, so Ivan led, followed by Martin and the rest of us, including Margaret, who showed she had lost none of her old skills to Munroing and Corbiteering. 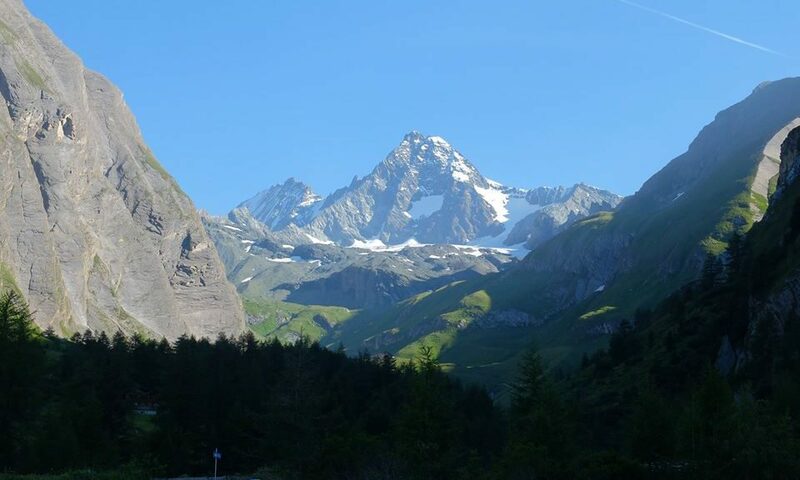 In the morning, Martin left for Chamonix and Ivan put the rest of us on the right road to the airport. A great trip and thanks to Ivan, Matti, Gerry, Karen and all their many friends for a level of craic and hospitality that will be hard to follow.